A favorable location for an ice-screw placement is the same as for an ice tool. A good choice is a natural depression, where fracture lines caused by the screw are not as likely to reach the surface (fig. 14-38a). A screw placed into a bulge in the ice, on the other hand, can cause serious fracturing that weakens the placement or makes it useless. If this happens, move the screw a foot or two and try again. Generally keep screw placements at least 2 feet apart—more in rotten ice—to reduce chances that fracture lines from one placement could reach the other, weakening both. Fig. 14-37. 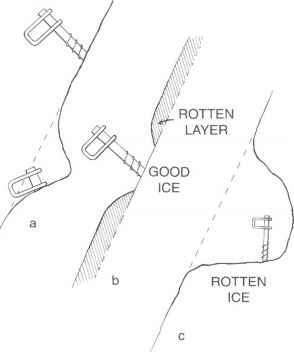 Ice bollard: a, diagram; b, with backup ice-tool anchor. 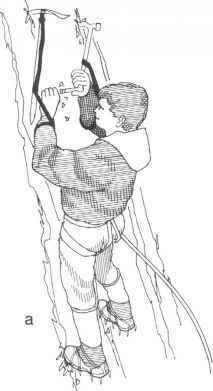 On ice topped with a layer of soft snow or rotten ice, scrape down with the adze to get to a hard, trustworthy surface before making the starting hole (fig. 14-38b). In extremely rotten ice, make a large horizontal step with a hand tool and place the screw vertically at the back of the step, in a starting hole (fig. 14-38c). Press the screw firmly and twist it into the ice at the same time. Fig. 14-38. 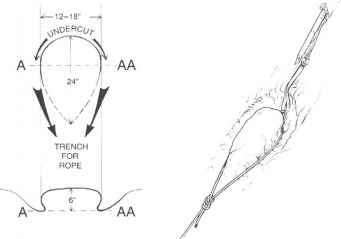 Ice-screw placements: a, in solid surface; b, with soft or rotten surface layer; c, in extremely rotten ice. chopping out the shattered ice with sideways strokes of the pick. A screw with sharp cutting teeth can sometimes be screwed in all the way by hand. If not, do it with the help of a lever through the screw eye; another ice screw or the pick of a hand tool works well (fig. 14-39). Some screws provide a kind of built-in ratcheting capability, simplifying the work of screwing them in. Twist the screw all the way until the eye is against the ice, tight and solid. Clip a carabiner into the eye, with the carabiner gate down and out. To slow melt-out in soft summer ice or direct sun, pack ice around the screw head. If the screw doesn't go in all the way, reduce leverage on it by tying it off at the surface of the snow with a runner, and then clipping into the runner. Climbing extremely steep ice is fatiguing, physically and mentally. To conserve energy and keep moving upward efficiently, climbers work to minimize the number of screw placements. If the ice is hard and solid, or the slope not extremely steep, only one or two protection points may be placed on an entire pitch. Unless the ice is rotten, only one screw is placed at each protection point. Fig. 14-40. Support from hand tools while placing an runners between tools and seat harness. wrist loop of a solidly planted hand tool (fig. 14-40a). 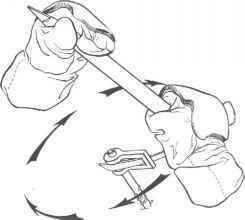 Or clip a runner from your seat harness to one or two securely placed hand tools (fig. 14-40b). On a moderate to steep slope, it may help to chop a step for standing in as you place the screw. On extremely steep ice, however, it's too difficult a job, so save your energy. 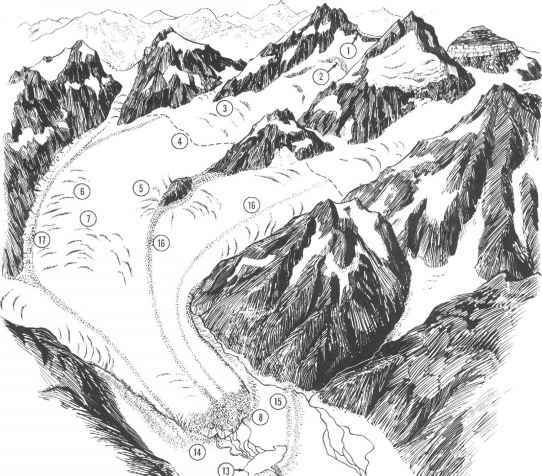 When it's time to place an ice screw, do it from your front points, and then continue climbing.